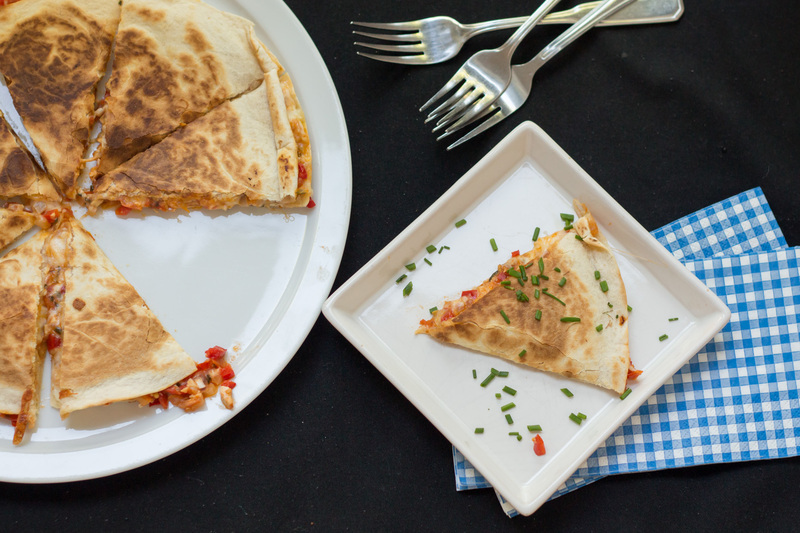 The ultimate juicy and cheesy quesadillas. I mean, you bite in it and the extra juice and the string of cheese. That’s it your hand are all messy but isn’t it even tastier? This is just the recipe you need to get ride of your chicken left over, being a rosted chicken, barbecue chicken breasts, it will do the trick! I did not have avocados or guacamole, it would have been a great addition. But let me tell you that even like this, alone, you don’t need to get convince to devour it! I choose vine tomatoes because there are more juicy. Also, red pepper is what I had in the fridge, but go ahead, yellow or orange are great too. Fruity peppers are just the perfect combination to the chicken. Oh and the cheese. Don’t forget it, it’s the best part! I had mozzarella but I used cheddar before and still good. Yep, you can’t go wrong with this recipe. How about this in front of the tv watching the soccer game, eh? Right, I don’t watch soccer, I will be on the terrace sipping a drink and licking my fingers! - In a pan, medium heat, melt the butter. Then add the onions. Let it brown. - Add the pepper and the tomato, reduce the heat and let it simmer for 5-7 minutes. - Add the chives, the chicken and the salt to taste and mix well. 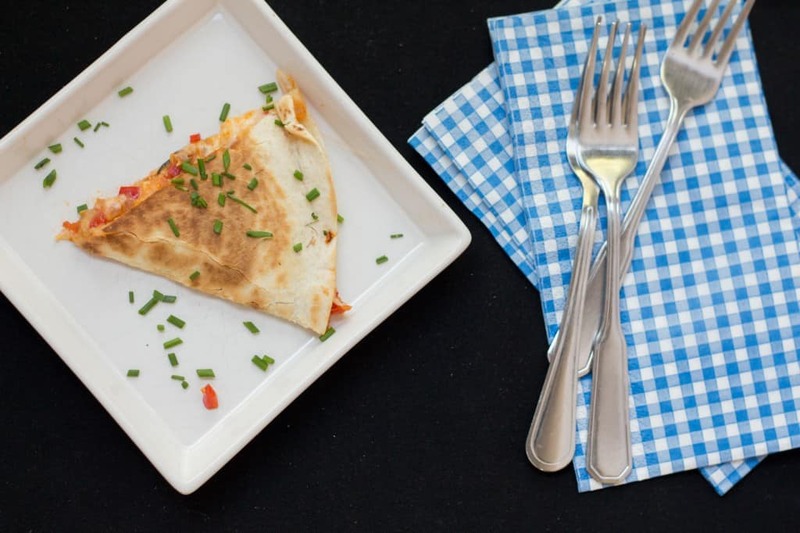 - In another pan, big enough to fit your tortilla crepes, at medium heat, place a crepe, 1/4 cup of cheese and half of your chicken preparation from the other pan, sprinkle another 1/4 cup of cheese and close with another tortilla. - Let it cook for 3-4 minutes and turn it over for another 3-4 minutes. - Repeat with the rest of the ingredients. 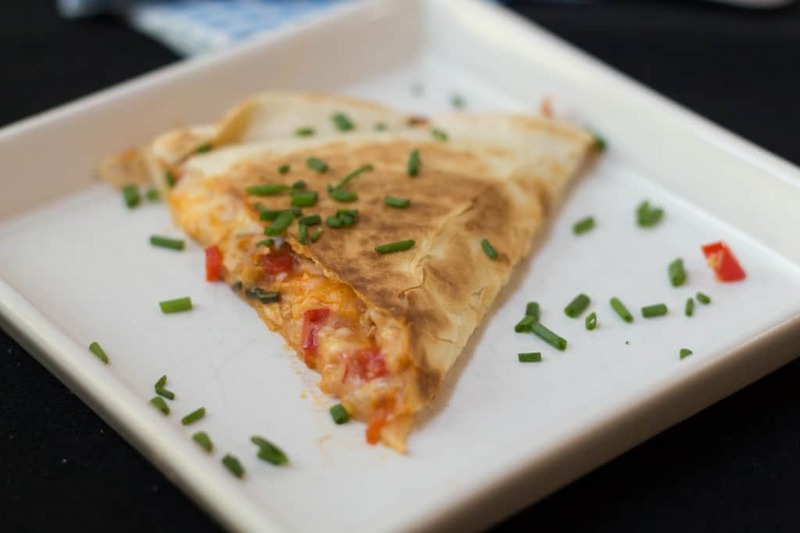 - Slice and serve while warm and extra cheesy! We were 2 adults and 2 kids and no leftover. We so need to do that 😉 I feel we could chitchat for a while you and I! Hope you are stay warm (specially your feet hehe ) in Australia. Thanks and thanks for stopping by Jess!